> Give Before You Go! Details coming soon! Give Before You Go 2019 will take place from May 3 - May 11. Congratulations! 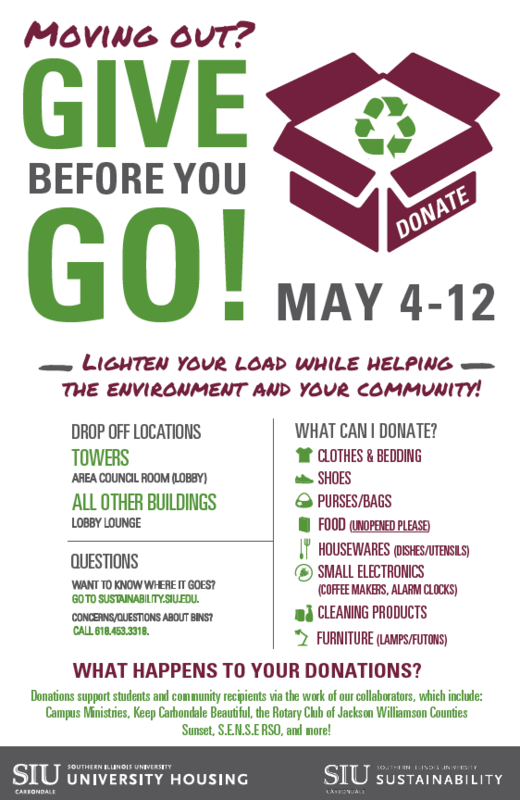 During May 2018 Give Before You Go!, SIU students donated the following to community organizations, also diverting these items from the landfill! 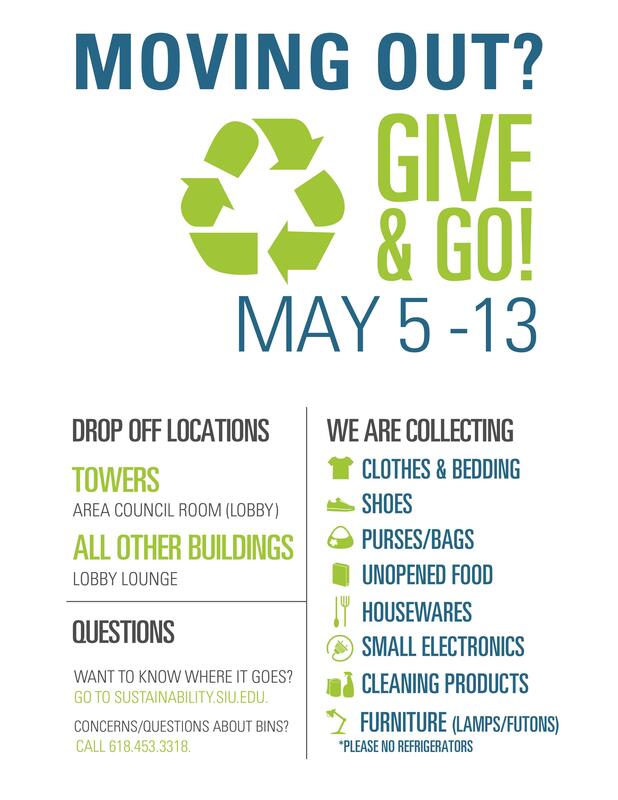 From May 4 to May 12, University Housing collaborated with the Sustainability Office and other on-campus and off-campus stakeholders to divert unwanted items from the landfill! Thank you to all students, staff, community members, and faculty who supported this program! If you have questions or concerns about Give Before You Go!, or you have suggestions for improvement for next year, please contact us at sustainability@siu.edu. Who did the donations benefit? Congratulations! During May 2017 Give and Go!, SIU students donated the following to community organizations, also diverting these items from the landfill! From May 5 to May 13, University Housing collaborated with the Sustainability Office and other on-campus and off-campus stakeholders to divert unwanted items from the landfill! Thank you to all students, staff, community members, and faculty who supported this program! If you have questions or concerns about Give and Go!, or you have suggestions for improvement for next year, please contact us at sustainability@siu.edu. Donations supported students and community recipients via our community collaborators, which include Campus Ministries (Wesley Foundation Food Bank, Saluki Food Pantry, the Carbondale Thrift Shop), Keep Carbondale Beautiful, the Rotary Club of Jackson Williamson Counties Sunset (The Carbondale Towers, Teach My Kenyan Children), S.E.N.S.E. RSO (winter coat collection for Saluki Food Pantry and partial bedding and towel collection for local organizations), and more. Congratulations! During May 2016 Give and Go!, SIU students donated the following to community organizations, also diverting these items from the landfill! Donation locations were available on campus for students living in our residence halls. Gaia House served as a location for off-campus students to donate their items. Thank you to all students, staff, community members, and faculty who supported this program! If you have questions or concerns about Give and Go!, or you have suggestions for improvement for next year, please contact us at sustainability@siu.edu. Campus Ministries and the Rotary Club of Jackson Williamson Counties Sunset were key community partners in our 2016 collaboration. Campus Ministries - Representatives from Campus Ministries helped to collect items that were distributed to the Wesley Food Pantry and the Carbondale Thrift Shop. Rotary Club of Jackson Williamson Counties Sunset - Representatives from the Rotary helped to collect household items that were directed toward the organization's Rotation Resale event. More info can be found in this video: https://www.youtube.com/watch?v=ebIJyyD5FZ0. The following organizations benefitted from the Rotary's work in 2016: This Able Veteran, Feed My Sheep Community Kitchen, The Boys and Girls Club, The Women’s Center, Good Samaritan Ministries, Giant City Stables Equine Therapy, Gum Drops, Herrin House of Hope, Lighthouse Shelter, The Nights Shield, The Murphysboro Food Pantry, Saint Francis Animal Shelter, Carbondale Towers, Department of Children & Family Services – Back Pack, Vergennes/Elkville Tornado Food for Volunteers.